Note that one would also be able to cast just about all of these in a silicone mould. 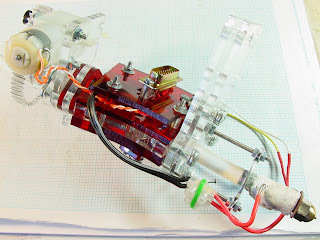 I've been working on the design of the Ponoko lasercut extruder. I've managed to make it fit better into the extruder socket and even made the "handle" on the extruder clamp variable in width for maximum grip by putting a split in it. By tightening or loosening the M5 locknut on the screw that goes through the "handle" (roughly in the centre of the picture) you can pull its two halves, expanding or shrinking the handle's thickness. 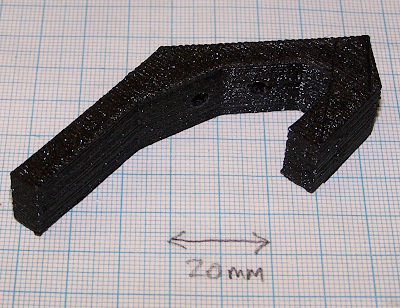 The whole thing is compatible with the Darwin exchangeable extruder, and in fact seems more rigid. 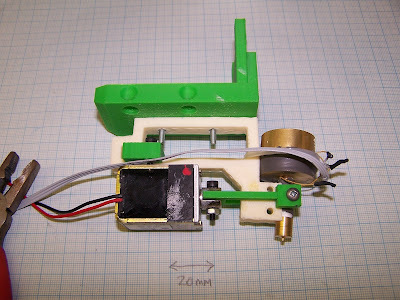 If there's an interest in making the extruder available as a kit on its own, let me know and I'll do so. Ever since we decided to separate the computation of slices from the driving of the RepRap machine by writing the computed slice movements to a G-Code file then subsequently re-playing that on the machine, we have known that that strategy would improve quality. This is because it removes dwells and delays from the build caused by the slicing code having to perform (sometimes quite intensive) computations. The G Code file has exactly all the right speeds and delays in it, and there is no significant delay in transferring the commands to the RepRap machine from simply reading a file. This improvement was confirmed experimentally and in production by Nophead's Hydraraptor work, and by Zach's ReplicatorG G-Code RepRap-driving program. 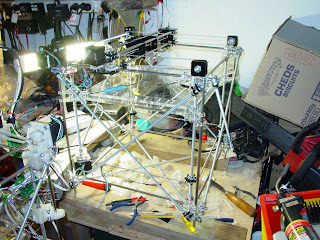 Here is the first build out of the standard RepRap Java host software updated as in the post below. It's the RepRap coat hook. I computed the slices and saved them to a GCode file (this took about 12 minutes). Then I replayed the file (this took about an hour and a half). This was on my home RepRap, driven by a Sanguino running the Sanguino GCode firmware extruding ABS at 240oC. Above is the coat hook unretouced just after the build finished. And here is it after brushing the hair off. The quality is almost as good as the superb results that Nophead gets, at which I am well-chuffed as I haven't finished tweaking the parameters yet. Tomorrow, Ed and I will get together in the lab at Bath to make sure this all works with the Arduino (which we have on the lab machine) as well as the Sanguino. 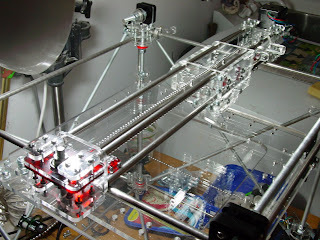 At long last, I have got the lasercut RepRap kit online, available now from Ponoko here. Cost of the lasercut components is approximately US$380 plus shipping, and it is compatible with the electronics kits and motors sold by the RepRap Research Foundation. As you can see from the photo on the right of the X axis assembly, it uses ball-chain instead of 2.5mm timing belt. What you can't see is that it also has an option for using lasercut bearing races instead of skater bearings. That worked really quite well. I've bearly started the instructions here. The instructions on the BitsFromBytes page are generally applicable and will fill most of the gaps, though the Ponoko variant does use more laminated parts to avoid having to use routing. I recommend using all clear acrylic as it is much easier to see through the parts and see what you're doing! I have also started acquiring Australiasian suppliers for PTFE rod, PLA filament, fine nichrome wire and stepper motors with a view to making a complete electronics kit available from local sources. Hopefully we can redress the balance and get a few more RepRaps going in the Southern hemisphere! Today has been a busy day... I'm also releasing ReplicatorG 0002. If you're not familiar with this software, its a generic GCode host software designed for use with RepRap machines. You feed it a GCode file, it parses it and then uses a driver based system to control a RepRap machine. Its simple, modular, and expandable. Its based on the Processing/Arduino codebase so it has a nice, friendly GUI system. Its also cross-platform straight out of the box. The installation process is pretty straightforward: download it and run it! You might have to install Java if you dont already have it. * move to a controller/model/driver system. You can download ReplicatorG from google code, or head over to the Replicat.org website to learn more about the software. I'm happy to release the v1.3 of the Sanguino software. This is a compatibility update for the Sanguino. I've fixed some minor compatibility issues with some of the core Arduino libraries. Anyway, you can download it from SourceForge or check out the Sanguino homepage. Recently, I've been working on the 'Generation 3' electronics based on the Sanguino / atmega644p chip. This new generation of electronics sets out to solve many different problems with the current electronics: modularity, simplicity of wiring, microprocessor power, as well as adding many new features: sd card support, lcd support, interface support, and much more. 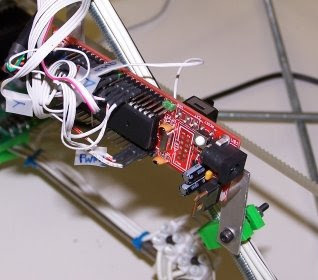 This next generation of electronics is a large topic, which I will cover in future blog posts, but for now I'd like to focus on one particular feature: the data bus for the modular extruder system. If you remember back to the days of the Generation 1, PIC based electonics we had a token ring system where each part of the system had its own microcontroller and was connected via TTL serial. This system suffered from many flaws, including noise in the serial lines connecting the various microprocessors. The Generation 2, Arduino based electronics fixed this by swinging to the opposite end of the pendulum: all the electronics are controlled by a single microprocessor and no serial data connections are required (except to the computer). The main disadvantage to this is that the Arduino is pretty underpowered to drive a complex system such as a RepRap machine. We managed to do it, but we had to take quite a few shortcuts. This basically means we're also pretty limited in the things we could achieve. The Generation 3, Sanguino based electronics will swing back towards the middle, using a 'best of both worlds' approach. It uses a more capable microprocessor which solves the memory and pin problems. However, even with more pins its is still tricky to drive more than 2 extruders, or one extruder and an LCD screen / button interface. Thus, we need a modular system to allow expandability. This long winded intro brings me to the subject of this post: RS485. This is a serial communications specification that uses differential signaling. The awesome thing about this is that it offers many cool things, one of which is improved noise immunity. As the wire contains the same signal twice (once normal, once inverted) When it gets to the other end, and the inverted signal is transformed into a non-inverted signal and combined with the original signal. Any electrical noise that was picked up is then cancelled out due to wave mechanics. Cool, huh? I'm not an electrical engineer, so this stuff is all pretty new to me. 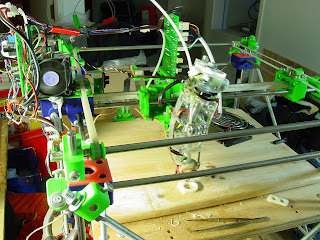 Fortunately, we have many smart people participating in the RepRap project with experience in many different areas. One of those people is Nophead, who you may remember from his excellent HydraRaptor machine. He might deny it, but he's an electrical genius and he gave me a chip number and a circuit for doing RS485 communications. Today I built and assembled it. In the picture you'll see the eventual setup I had going. I wired up two RS485 circuits to two Arduinos, and wrote a quick sketch to get them talking. The connection was a very long long, unshielded, twisted pair cable from an old ethernet cable. I hooked all these up and started them communicating. It worked great! I also did a test to try and inject some noise into the system by operating a powertool right next to the wires. It was very unscientific, but the RS485 connection didn't skip a beat. There was one problem that I ran into, which was easily fixed. The Arduino only has one hardware serial port, which was being shared by the RS485 chip as well as the FTDI usb -> serial converter chip that is on all Arduinos. The problem was that when uploading a new sketch to the arduino, the RS485 would also be sending and receiving data which would seriously mess with the uploading process. Luckily, the RS485 chip has both a transmit enable and a receive enable pin. I used the appropriate pullup/pulldown resistors to default these both to off so that when the Arduino was reset for the upload process, the RS485 was disabled. This means that I had to wire up an additional two pins on the arduino to control the RS485 receive/transmit status. This is not a big deal because using RS485 frees up a lot more pins than it uses, so there will be plenty of pins available. Anyway, today was a good day of hacking. Hopefully later this week I'll be able to wire up the SD card and run it through its paces. Luckily for me, there are schematics and code already written for the Arduino all over the internet, which means that it will be fairly trivial to wire it up and getting it working on the Sanguino. I've managed to put together one extruder from the bits of lasercut prototypes Ponko have been cutting for me. It slotted straight in to the Darwin head exchange mechanism, but was a bit loose. 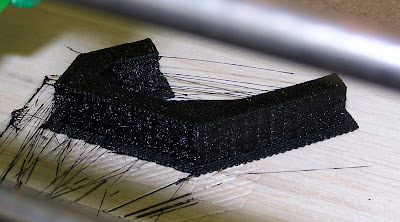 I've got a better extruder base already being cut by Ponoko so I was expecting that and simply wrapped it with tape. 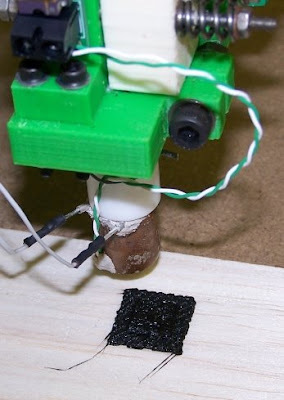 The extruder motor is a little far away, so a temporary heave-to has been executed with a cable tie. Sorry, ugly. Is also fixed already. I've loaded it with ABS and am now printing components with it, as you can see in the photo, as well as a classic Mighty RepRap Power Ring. I've fitted the ABS extruder to a Darwin to try my hand at testing out ABS, Imagin Plastics were kind enough to give me a 50m sample of 3mm ABS natural. Looks good, and I should be able to get it for under NZ$20 per 100 metre coil. I've found ABS to be generally the hardest plastic to work with. It needs high temperatures, high pressures, and isn't that keen to laminate. You have to work in thin layers to keep lamination, which slows me down. It does score on accuracy and tidiness, however, as the paste-like exudate stops fairly rapidly even without a valved nozzle. You need to have your nozzle mounted very rigidly, because ABS is not that easy for the hot nozzle to plough through if there are any rough bits sticking up from the surface. This is another reason I found to use thin layers and go slowly. Things bode well for an alpha release of the Ponoko lasercut components kit. I'm getting excited about that, and it should tie in nicely with the imminent arrival of Zach's new shipment of extruder motors on the RRRF site. Oh, the curly-white wave flowing over the top of the big washer holding the extruder barrel is an ABS leak between the PTFE insulator rod and the top of the brass M6 extruder barrel. I hadn't anticipated the need to seal it, but the ABS starts pressurizing some way up the PTFE rod and squooshes out the gaps in an organic way. I'll seal the gap with PTFE tape when I install the latest extruder clamp assembly off the pending prototype lasercut run. I've also been working on the Generation 3 electronics for a while now. One of the things I'm aiming to achieve is making everything a bit more friendly to assemble. One of those things is the switch to using IDC connectors where possible. These things are super easy to make, polarized, and fairly cheap. I'll be coming out with a 'Sanguino Motherboard' soon which will have complementary IDC headers. Wiring up your RepRap will be *much* simpler with these new electronics. Of course, you can easily just have an IDC connector on one end and route the individual wires to where you want. 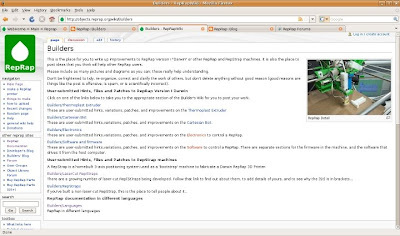 Files posted to SourceForge or available in SUbversion as always. I'd like to take this opportunity to reflect on the past few years of work (wow!) and say that I've thoroughly enjoyed working on the project and I look forward to working on it even harder in the coming years. When I first started working on RepRap, I was a wild-eyed college student with dreams of 3D printers and being able to whip together a 3D printer in a few days and start changing the world. Of course a few days turned into weeks, which turned into months, which turned into years. I've learned a *ton* along the way though and have had my share of mis-steps as well. I've come from basically zero understanding about electronics, firmware, microcontrollers, extruders, and cartesian robots to a point where I am reasonably comfortable with all of those technologies and am now active in developing and hacking on the next generation designs. We've come a long way as a project from the early days, and luckily things have only changed for the better. For example, when I first got started, the first thing I did was build the electronics. Except there were no manufactured boards. Adrian had but up a little how-to on the website about how to etch your own boards. I decided that this was way too hard for myself (and by extension, your average person) so I decided that I would get them manufactured. Thus the RepRap Research Foundation was born. Since then, nearly every single part you need to build a RepRap is now available from either the RepRap Research Foundation, or BitsFromBytes. I'm not sure where I'm going with this, but I'm excited about the future of this project. Now that I have these physical objects in front of me that my machine produced, it feels so much more real. No longer is the printer this magical dream that I've been chasing for so long, but it is something that I have sitting in front of me. There are many things to be improved, and there are many things to be changed, but it works, and thats good enough for now. For all those out there who are just following along, or are struggling with building your own machine: keep up the fight, and keep hacking on it. You'll have your machine working and when you do it will be beautiful. Well, it's been about eighteen months since hitting a milestone on my Reprap work has caused me to to break out my 12 year-old Mcallans' single malt. Tonight... is the night, though. I should possibly have published this in the Builders' blog. I reasoned that you could do this with a Darwin, however, so I published it here in the main blog instead. What you are looking at is a six-toothed involute profile sprocket gear cut on Tommelise 2.0. It has a pitch radius of 6 mm, a pressure angle of 20 degrees and with its involute profile surface defined by six planes. I cut it with a 1/16th inch cutter mounted in a flexible drive shaft on a standard Dremel hand tool mounted to Tommelise 2.0's positioning robot. It was cut in commercial 1/4th inch black, HDPE sheet. This sprocket is probably smaller than it needed to be. I wanted, however, to test the envelopes of my Slice and Dice software, the cutter and the positioning accuracy of the Tommelise positioning robot. I could probably get eight teeth on a 6 mm pitch radius gear, but that would be right at the limits of my system. It took me about two and one-half hours to cut it. Most of that time was spent worrying that I'd mar the piece. It should go quite a bit faster in future now that I have the parameters for working HDPE on this machine.